Usain Bolt has blamed his dodgy starts for his shock 100m defeat to Justin Gatlin at the London Stadium. The eight-time Olympic champion eventually came third as Christian Coleman also pipped him to silver. 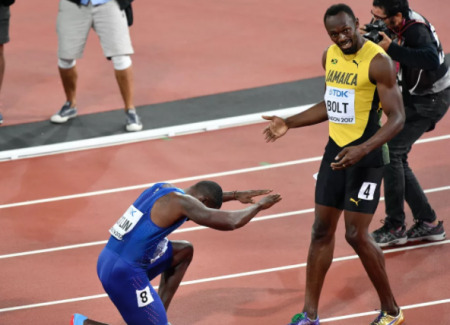 Bolt complained about the starting blocks at the World Championships after his heat victory on Friday night. Bolt told the BBC: “The start is killing me. Normally I get better though the rounds. “It felt like it was there but the reason I lost was because I couldn’t get it. You have to transition. “I didn’t get the transition right and tightened at the end which you should never do. “I ran shoes in warm up and a I felt smooth but I didn’t execute when it matter. “These aren’t the best blocks. I was not fully comfortable with them.